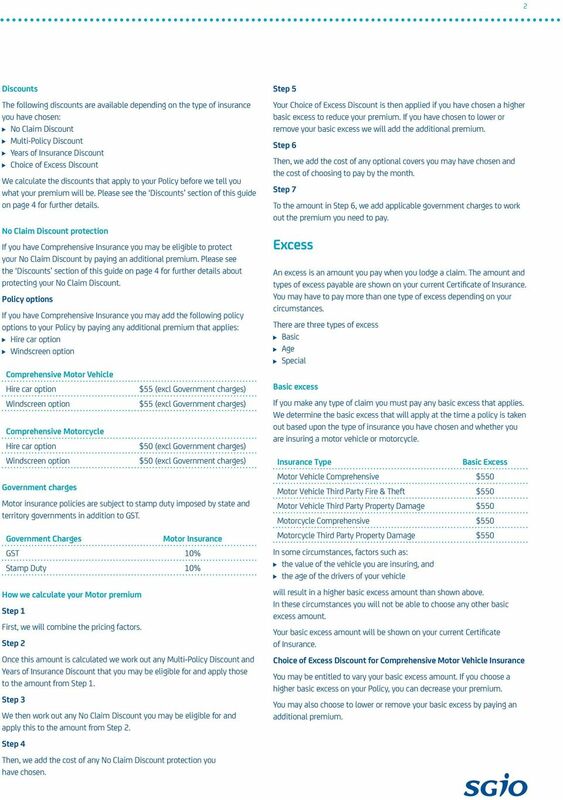 Download "SGIO Motor Insurance Premium, Excess & Discounts Guide WA"
2 2 Discounts The following discounts are available depending on the type of insurance you have chosen: We calculate the discounts that apply to your Policy before we tell you what your premium will be. 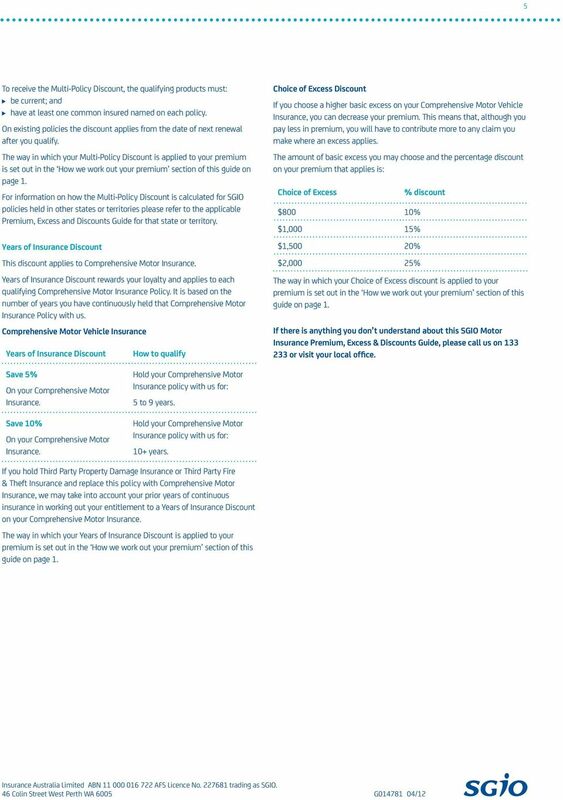 Please see the Discounts section of this guide on page 4 for further details. protection If you have Insurance you may be eligible to protect your by paying an additional premium. 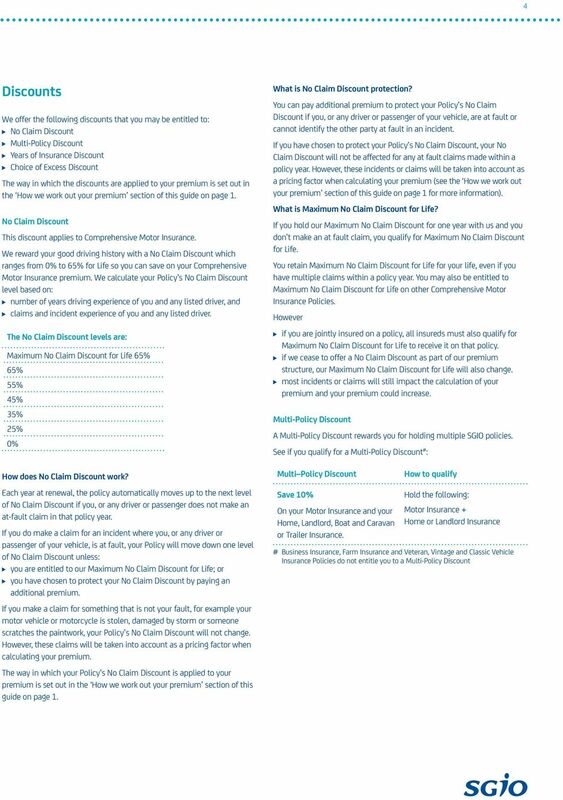 Please see the Discounts section of this guide on page 4 for further details about protecting your. Policy options If you have Insurance you may add the following policy options to your Policy by paying any additional premium that applies: Vehicle cycle Government charges $55 (excl Government charges) $55 (excl Government charges) $50 (excl Government charges) $50 (excl Government charges) insurance policies are subject to stamp duty imposed by state and territory governments in addition to GST. Government Charges Insurance GST 10% Stamp Duty 10% How we calculate your premium Step 1 First, we will combine the pricing factors. Step 2 Once this amount is calculated we work out any and that you may be eligible for and apply those to the amount from Step 1. Step 3 We then work out any you may be eligible for and apply this to the amount from Step 2. Step 4 Then, we add the cost of any protection you have chosen. Step 5 Your is then applied if you have chosen a higher basic to reduce your premium. If you have chosen to lower or remove your basic we will add the additional premium. Step 6 Then, we add the cost of any optional covers you may have chosen and the cost of choosing to pay by the month. Step 7 To the amount in Step 6, we add applicable government charges to work out the premium you need to pay. Excess An is an amount you pay when you lodge a claim. The amount and types of payable are shown on your current Certificate of Insurance. You may have to pay more than one type of depending on your circumstances. There are three types of Basic Age Special Basic If you make any type of claim you must pay any basic that applies. We determine the basic that will apply at the time a policy is taken out based upon the type of insurance you have chosen and whether you are insuring a motor vehicle or motorcycle. Basic Excess Vehicle $550 Vehicle $550 Vehicle Third Party Property $550 cycle $550 cycle Third Party Property $550 In some circumstances, factors such as: the value of the vehicle you are insuring, and the age of the drivers of your vehicle will result in a higher basic amount than shown above. In these circumstances you will not be able to choose any other basic amount. Your basic amount will be shown on your current Certificate of Insurance. for Vehicle Insurance You may be entitled to vary your basic amount. If you choose a higher basic on your Policy, you can decrease your premium. You may also choose to lower or remove your basic by paying an additional premium. 3 3 What are the choices of basic for Vehicle Insurance? You may choose one of the following amounts as your basic : $0 $300 $550 $800 $1000 $1500 $2000 For more information on the discount available on your premium if you choose a higher basic, please see the Discounts section of this guide on page 4. Age This is paid in addition to any basic and applies to: any driver under 25 years of age, or any driver 25 years of age or over with no more than 2 years driving experience after obtaining a provisional or probationary licence but does not apply to: a learner driver who was accompanied by a fully licensed driver aged 25 years of age or more. The following three tables explain what age may apply at the time of a claim: If you have named an under 25 year old as a driver on your Policy: Insurance years $ years $ years $ years $450 If the driver of your motor vehicle or motorcycle is under 25 years of age and you have not named an under 25 year old driver on your Policy: Insurance $1,250 If the driver of your vehicle is 25 years of age or over with no more than 2 years driving experience after obtaining a provisional or probationary licence: Insurance $300 You cannot pay an additional premium to remove an age. When an does not apply There are a number of instances in which you will not be required to pay an when we pay your claim: If you make a claim for Then you will NOT have to pay an Third Party Property Theft or attempted theft Windscreen, sunroof or window glass damage only Storm, flood or fire damage Vandalism or a malicious act to the vehicle while it is parked An incident that we agree was not in any way the fault of you, the driver of, or a passenger in your vehicle and you can provide the name and residential address of a person(s) we agree is at fault the amount of the claim is more than any basic Windscreen, sunroof or window glass damage only Fire Theft Insured ist Uninsured ist Uninsured ist Age Basic, age or special Basic, age or special (only when you have chosen the ) Age Special We may decide to apply a special to an individual owner or driver, or in relation to a specific incident, taking into account such factors as the type of vehicle and owner or driver incident, claims or traffic offence history. The amount of the special will be shown on your current Certificate of Insurance and generally ranges from $200 to $2,500. A special is payable in addition to your basic or age. You cannot pay an additional premium to remove a special. HOME CAR WITH OUR INSURANCE YOU CAN BE READY FOR JUST ABOUT ANYTHING. Accidents, break-ins and extreme weather can happen at any time. But with the right insurance, you can be ready for just about anything. Insuring. vehicle. your. A guide to the principles of motor vehicle insurance to help you choose the cover you need. Boat Insurance Product disclosure statement and policy booklet WA Thank you for choosing SGIO. SGIO has been insuring West Australians for over 85 years. And that s the difference we offer you experience. NAB Car Insurance Supplementary Product Disclosure Statement (SPDS) Preparation Date: 01/12/2011 Important changes to your NAB Car Insurance Policy Document (Product Disclosure Statement). This SPDS: a. 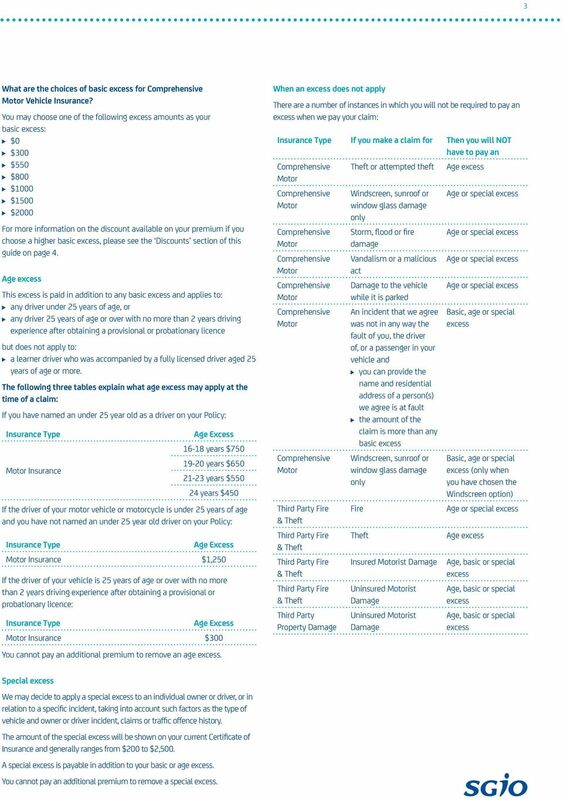 Complete Care Motor Insurance Product Disclosure Statement and Policy Booklet RACV Motor Insurance is issued by Insurance Manufacturers of Australia Pty Limited ABN 93 004 208 084 AFS Licence No. 227678. If you buy insurance, you are making a personal decision about how you want to manage your risk if things go wrong. 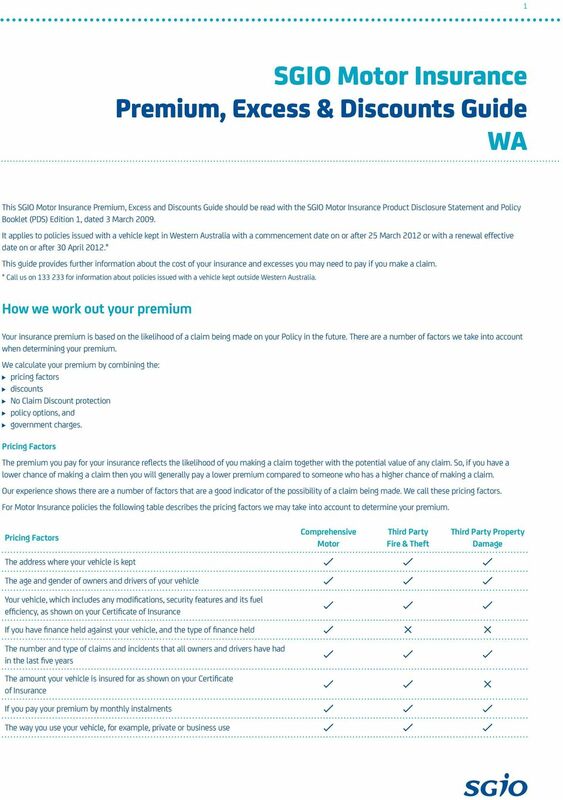 COMMINSURE HOME INSURANCE PREMIUM, EXCESS AND DISCOUNT GUIDE.